Moves items from their original location, generally one of your active folders, to an archive folder. Where do my items go? Some of the folders might be hidden folders. For more information about viewing hidden folders in Windows, see Show hidden files. Permanently deletes items that have passed their aging periods. Note: If you choose to have items deleted, they are not archived. If you choose to have items archived, they cannot be deleted by an AutoArchive. Once items are archived, they can only be deleted manually. For more information about the AutoArchive feature, see Archive older items automatically. Note: Folders that you create that contain the same type of items as the Inbox, Calendar, Tasks, Notes, or Journal have the same default, six-month aging period. For example, a mail folder that you create for status reports received from a co-worker or a contact folder you create for personal contacts. The received date/time or when you last changed and saved the message, whichever is later. Marking a message as read or unread is an example of a message change. The date when you last changed and saved the item, whichever is later. Recurring items are not AutoArchived. The completion date or when you last changed and saved the task. Tasks that are not marked complete are not AutoArchived. Tasks assigned to other people are archived only if marked complete. When you last changed and saved the note. The date the Journal entry was created or when you last changed and saved the entry. Contacts are not archived by default. However, you can manually archive them. See the following descriptions for the settings and options that you can apply when customizing AutoArchive. Run AutoArchive every n days Choose how often AutoArchive runs. Archiving many items at the same time might slow your computer's performance. Therefore, it is better to use AutoArchive more frequently to reduce the number of items processed. 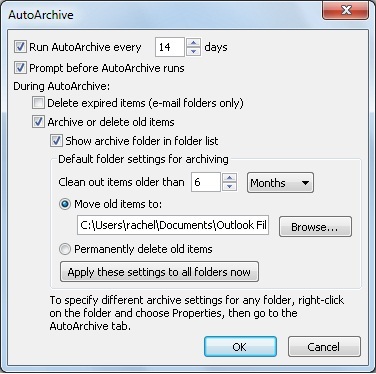 To turn off the AutoArchive feature, clear the Run AutoArchive every n days check box. Prompt before AutoArchive runs Choose whether you want a reminder message to appear before AutoArchive processes your Outlook items. When prompts appear, you can click No on the reminder message to cancel that AutoArchive session. Delete expired items (e-mail folders only) This option is off by default. Select this check box to delete messages after their aging period has passed. Archive or delete old items Choose this option if you want to set or change the settings that follow. If this check box is cleared, AutoArchive runs using default settings. Show archive folder in folder list Select this check box to have the Archive folder listed with your other working folders in the Navigation Pane. If you do not use this option, you can still open your archive folder — click the File tab, then on the Open tab, click Open Outlook Data File. Clean out items older than Specify the age at which you want items to be archived, in days, weeks, or months. You can configure a period of one day up to a maximum of 60 months. Move old items to Select this check box to archive old items instead of automatically delete them. The default folder appears in the box. To use a different folder, enter the folder location in the box or click Browse. Selecting this option clears selection of the Permanently delete items option. Permanently delete items This option deletes any expired items. They are not moved and no archive copy is kept. Selecting this option clears selection of the Move old items to option. Apply these settings to all folders now This option applies the AutoArchive settings, including your changes, to all folders. To specify unique settings for one or more folders, do not choose this option. Instead, right-click the folder, click Properties and then go to the AutoArchive tab to change settings for each folder that you want to change.